This week, we have two new knitting goodies to celebrate: the book Inspired to Knit by Michele Rose Orne, and the new Fall 2008 issue of Knitscene magazine. I thought it might be interesting to ask three Knitscene designers what had inspired them to design and knit their pieces for this issue. As a designer and semi-crazed sock enthusiast I am always looking for original inspiration and unexpected details in knitting. Ideas can hit you anywhere, whether traveling through the spice markets of Southern India or waiting to have your tires replaced at a gas station. It doesn’t matter where you are; images, color and patterns surround you. For this issue of Knitscene, I was inspired by the simple lines and geometry of a kimono. I played around with wrapping and layering fabric around the cuff of a sock when it hit me to try stitch patterns that simulate a wrap without adding the extra bulk. I sketched a few ideas of what a kimono might look like wrapped around a foot and started to get really excited. The lines gave the socks interest from every angle. The completed socks simulate a kimono in design, but also have a fun twist to suggest a sash: ties that are knit into the fabric as you go. They are created by casting on and binding off stitches in the middle of a round, so there are no extra ends to weave in when you’re finished. Another current obsession I have is aligning the “right” yarn with the “right” pattern. When successful, they are meant to compliment each other like a great relationship. The right yarn will show off a pattern in the best possible way. The right pattern will make the yarn sing. Each is better for the harmonious pairing. For this project, Louet Gems is a fantastic yarn to work with, producing a fabric with clear stitch definition and available in a full spectrum of colors. Ginger is a classic turning leaves fall color perfectly suitable for a Japanese inspired sock. Plus, this project works up pretty quickly in sport weight yarn. ABOUT ME: I am a designer and writer living in Portland, OR. I have contributed both articles and patterns to a number of places in print and online, including the 2009 Pattern a Day Calendar, the book “Expectant Little Knits”, knitty.com, and through Ravelry. 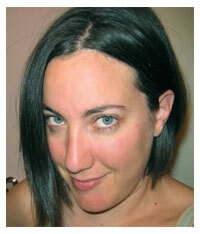 In 2007, I was a guest on diy’s knitting TV show “Knitty Gritty”. I started the annual online spin-along, The Tour de Fleece in 2006 to spin yarn along with the Tour de France. I’m especially proud of the ribbons I won for homespun yarn at the LA County Fair in 2006 and 2007. I love the way a big fair can combine excellence in craft with deep fried Oreos on a stick. When I’m not designing, I’m dreaming about designing. I’m also knitting, spinning, dying fiber, writing, doodling, walking, doing crossword puzzles, drinking tea, eating chocolate, stretching, contemplating the cruelty of existence, and exploring the great Pacific Northwest. View the Fall 2008 Preview of Knitscene magazine! How about some expert design advice from the pros? In the Style series, Pam Allen and Ann Budd give you not only dozens of beautiful, inspirational patterns, but also a unique Design Notebook in each volume that provides guides to designing your own beautiful garment: Wrap Style, Scarf Style, Folk Style, Bag Style, and Lace Style. REMEMBER: The books in the Hurt Book Sale aren't pristine, so if you want a lovely pristine copy all your own, visit your local yarn shop! Sandi Wiseheart is the editor of Knitting Daily. What's on Sandi's needles? The Camisa, from Knitscene Fall 2006! I finished the Drawstring Raglan, and now I have swatched and cast on for a new summer top, in sparkly, wonderful yarn (String of Pearls from Muench). Love the yarn. Love the pattern. Stay tuned for photos!